You may remember my post a couple weeks ago about visiting a local lavender farm and harvesting my own bundle of culinary lavender. I was so excited to use my flower buds in a recipe, but first I had to wait for the lavender to dry. After waiting impatiently, my lavender was finally ready to go over the weekend! 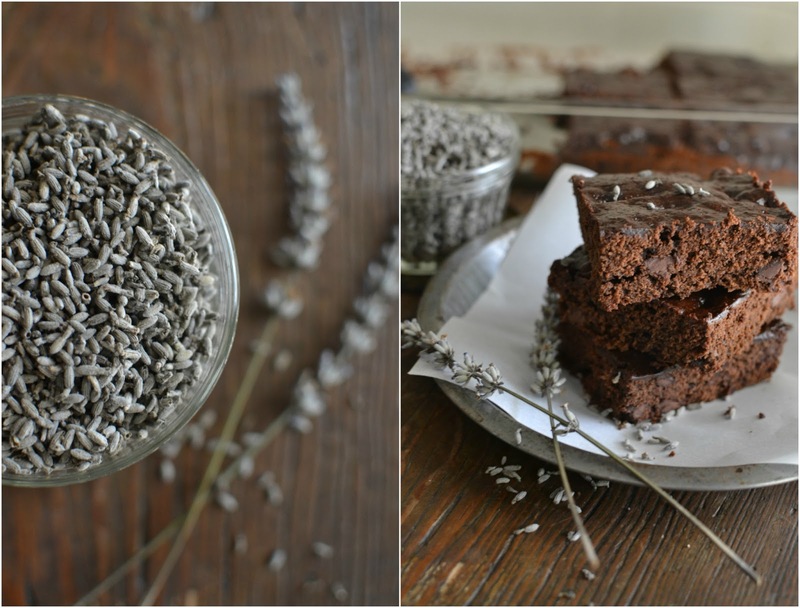 I remembered the farm owner speaking about how lavender can bring out and enhance the chocolate flavor in dessert recipes, so I thought I'd try using it in some double chocolate brownies. I was already into my recipe when I realized I only had 1/2 cup of sugar, so I improvised and changed things up a bit. To my surprise, it worked out really well and the brownies were delicious! My recipe is a mix of several different recipes I've seen online (here and here) with some adaptations of my own. 1) Preheat oven to 350 F and grease a 9x13" baking pan. 2) Whisk water, oil, and eggs in a large bowl to blend. 3) Add the flour, baking powder, salt, cocoa powder, sugar and honey. Stir well until mostly blended then add in the chocolate chips and lavender. 4) Pour batter in prepared baking pan (batter will be thick) and spread out with a spoon. 5) Bake until a toothpick inserted in the center comes out with a few moist crumbs attached, about 25-30 minutes. Cool completely before cutting (I find that a plastic knife works best when cutting brownies). My addition of coffee and lavender really brings out the chocolate flavor in these brownies (of course the chocolate chips don't hurt much, either). The texture is light and fluffy with a nice crumb, which is a little more cake-like than I'm used to but a nice change of pace. The brownies aren't overly sweet and the lavender adds just the right floral touch to make the dessert seem so sophisticated. I don't know that I'd make these for kids, but if you are looking for a dessert that's a little more grown up, this is the one for you. Have you ever used lavender in a dessert recipe? That sounds interesting...I have used our lavender to make soap...but never cooked with it...I'll have to try that sometime. Have a great Monday!! Yay! I was hoping you would post your recipe. These looks so yummy! I have made lavender lemon shortbread cookies which were delicious. Growing up, my Mom and Dad used to garden and grow edible flowers, which I loved. I love the idea of eating something that's pretty too! :) These look like a recipe we will have to try! Ohhh yummy!! Sounds great! We actually have just been given some lavender to plant from our friends so I'm excited! They look yummy! I love brownies! My grandson can't have dairy; I will try this recipe! The brownies look great. I am not so familiar with cooking with lavendar. I am sure it would be a unique taste. I would love to plant some but I usually do not do very well with lavendar...just does not seem to do well for me. Have a great day! Blessings! Oh yum. Never cooked/baked with lavender before. I'll eat these right up for you! Those look amazing! I will have to try. Thanks for posting the recipe. Never even thought of cooking/baking with lavender but it makes perfect sense. I love your photos. Very professional Tammy! I love that you used dried lavender in these. They look beautiful in your photos, I bet they were delicious! Oh my....beautiful and decadent. Um.....samples? Well I love brownies anyway, so add a little coffee and lavender and yes indeed....right up my alley! :) Beautiful photos. They sounds delicious, Tammy! If I get the opportunity to try lavender, I will follow your recipe! Wow those photographs are gorgeous, so nicely styled! And the brownie, wow! I'm on a no refined sugar diet for health reasons and it's pictures like this that test by self control! Our housemate makes lavender cream which is delicious! Tammy, your brownies look and sound delicious! I have not tried lavender in food but there is always a first time. My old time favourite dish not for kiddies as you say, but worth a try I'd say. I have never tried lavender in food before and now I am curious to try these. Your food photos are gorgeous! I have had lavender truffles at my sister's fair trade pantry, and hand made chocolates at a local farmers market. They tasted so nice. As you say, sophisticated. I did make some lavender sugar cookies once but didn't really care for them, even though lavender is my favorite floral scent. I have to say, they look really good. Think I am going to have to try them out. Cayenne is another fun addition!! Your brownies look and sound amazing and I can't wait to try this. I have lots of lavender right! Your recipe seems very good! No lavender, but I do add mini reeces peanut butter cups quartered!! You're is much healthier!! Thank you so much for the great recipe, Tammy.. I have lavender growing and will try to give it a try..
Oh my gosh, these look amazing. And your photography is just gorgeous, as usual! Tammy, they look fantastic!! Your recipe sounds simply amazing! I will definitely be pinning it on my "Lavender Is Essential" board!! And if I figure out where to get some of this kind of lavender I will give it a shot for an upcoming tea party!! Oh my goodness these brownies look so delicious!! I like how you set up those food dishes! You take great photos of dishes and things you only want to show! And that's not easy! Looks absolutely divine! I haven 't used lavender in cooking before but would love to once my lavender plants start flowering this year. Deeeee-Lish! And dairy free too, yippee!!! WOOOWWW What a lovely post:) and your blog Is SO cute.